Havaldar Saroop Singh was born on 15 April 1924 in Koteri village of Poonch district in Jammu & Kashmir. Son of Sri Kishan Singh,. 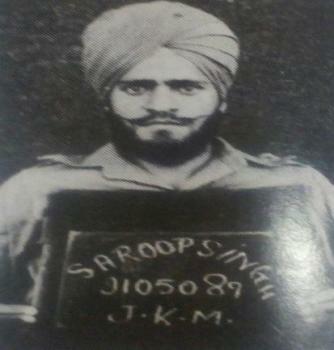 Hav Saroop Singh joined the army on 15 April 1948 at the age of 24 years. Soon after independence, in 1948, in order to save Ladakh from the intruders from across the border, the ‘Nubra Guards’ were formed by the Indian Army out of the local ladakhi warriors. In 1952, they formed the 7th Bn J&K Militia. 14th Bn J&K Militia was subsequently raised in 1959 at Srinagar. Hav Saroop Singh joined the 14th Battalion after its formation which later got deployed to defend against the Chinese aggression in 1962. During his service career Hav Saroop Singh served in various places with different terrain and operational conditions. 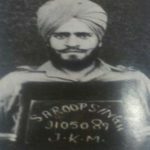 By 1962, when the Indo-China war broke out, Hav Saroop Singh had already put in more than 13 years of service and evolved into a battle hardened and dedicated soldier. During the Indo-China war of 1962, Hav Saroop Singh’s unit was deployed in Ladakh, the main battle ground for the war. Though a full-fledged war broke out between India and China on October 20, 1962 when the People’s Liberation Army of China invaded Ladakh and Arunachal Pradesh (then known as the North East Frontier Agency) in a synchronized move, the border attacks had already started much earlier. One such attack was carried out by the Chinese forces on 19 Oct 1962. On 19th Oct 1962, Hav Saroop Singh was deployed at the Bhujang post and was functioning as second in command of the post. Hav Saroop Singh took upon himself to repulse the attack and fought gallantly along with his comrades. Though Chinese forces were numerically superior, Hav Saroop Singh and his troops stood ground, displaying extraordinary courage and determination. However eventually Hav Saroop Singh was overpowered and was martyred. In this heroic action, Hav Saroop Singh displayed exceptional gallantry and dedication to duty in the face of heavy odds. Hav Saroop Singh proved to be a valiant and committed soldier who made the supreme sacrifice in the highest traditions of the Indian Army. Havaldar Saroop Singh was given the nation’s second highest gallantry award, “Maha Vir Chakra” for his exceptional courage, unyielding fighting spirit and supreme sacrifice. On the night of 19 October 1962 when a post at Bhujang in Ladakh was attacked by the Chinese, Havildar Saroop Singh, second in command of the post, fought gallantly until he was overpowered and killed by the enemy. 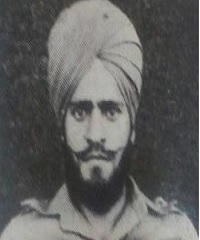 Havildar Saroop Singh displayed courage and devotion to duty of a high order. Havaldar Saroop Singh fought bravely with highest tradition of Khalsa, attained martyrdom but didn’t budge an inch to save the motherland and finally brought honor to the regiment and Indian army. His supreme sacrifice will serve the role model for current generation to follow. All Jammu and Kashmir residents should come forward and to raise fund to made a movie on the brave act of this Martyr.